Try this Papad Chat recipe given here - otherwise try this recipe with any of the mentioned items- Idli,Dosa,Puri,Chapathi pieces, bread pieces,boiled Sweetcorn kernels,plain biscuit pieces,Plain wafer pieces,potato wafle pieces,etc,. Microwave the 5 or 6 Papads(placing them in a circle) for 1 to 1 1/2 min on high. Take them out and crush them(after 5 mins time) into small pieces. Add this to the Microwave bowl with all other ingredients and mix them well. Microwave this on high for 2-3 mins and take the bowl out. Serve this Papad Chat hot with extra Sweet Tomato Sauce separately at tea-time. Note: U can add boiled potato(1 no) pieces (Peeled and chopped into bite size cubes) mixed with little salt-1/2 tsp and white pepper powder-1/2 tsp (sprinkled on them)- in Step 3. Hi christy !An innovative receipe. V do papad kosimbir with grated coconut.next time vl try like this.thanx. Thank u so much Sarah,Priyanka and Mr.Shah for ur feedback. liked dis recipe very much,thnx a lot christy. 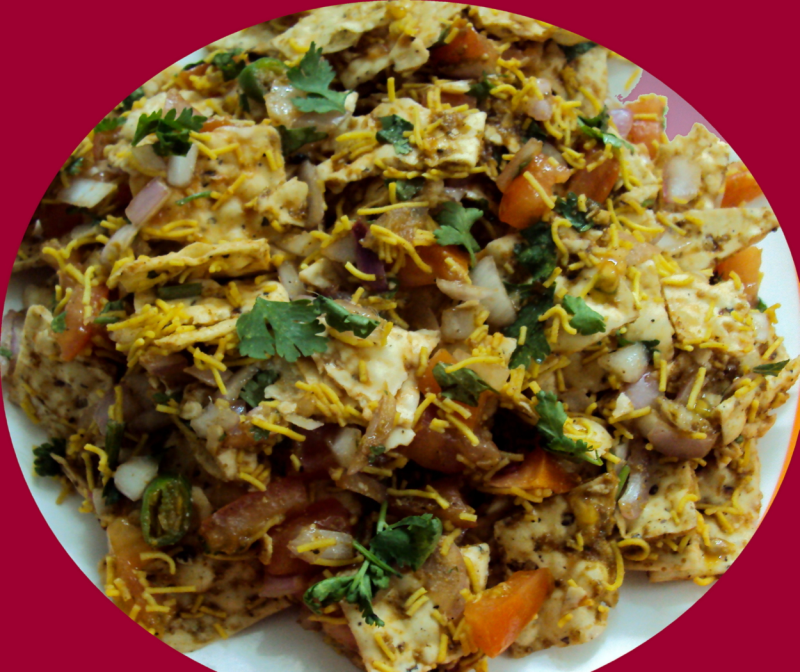 Hi Christy, Great recipe, i have heard of masala papadum but never heard of papad chat. very creative. Hi rabz!.Thank u so much again. Try this Chat recipe with bite sized French Fries too.